This number is constantly changing. During anticipated busy times, we staff between 6 and 7 people upstairs, and another 1 to 2 downstairs in the gym. During quieter mid afternoon times, we may have 3 to 4 staff members on duty. AaThis number is constantly changing. During anticipated busy times, we staff between 5 and 6 people. During quieter mid afternoon times, we may have 2 to 4 team members on duty. All Team Members are “on call” and can be summoned to help out at any time. The Manager on Duty can also step in. Shift modifications are made when we notice a change in facility usage. Morning hours tend to be the busiest.ll Team Members are “on call” and can be summoned to help out at any time. The Manager on Duty can also step in. Shift modifications are made when we notice a change in facility usage. Morning hours tend to be the busiest. Yes, we ask that you do call ahead if you have a baby under 12 months. If you just show up with your baby, and the infant area is already full, you may be asked to wait until a baby is checked out. We will certainly do what we can to shift staff members around to accommodate your baby, but a reservation will help us prepare from our end. Please call 616-575-8610 even if it’s just as you are heading out of the house to come to the gym! Infant reservations may be made up to 12 hours in advance. The Kid’s Stuff areas are for children only! 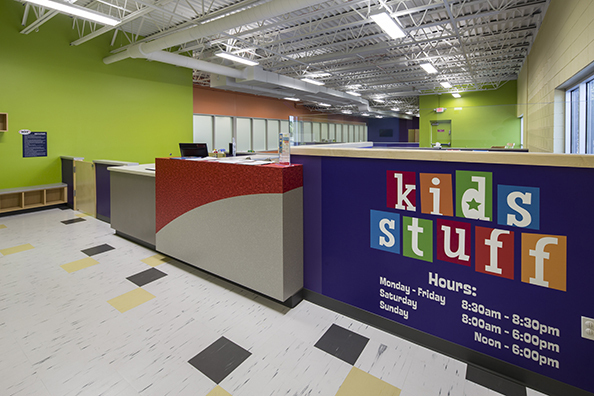 If you are new to the MVP Athletic Club, and need to walk your child in the first time or two, that is fine, but as a rule, Club members or visitors without children are not to be in the Kid’s Stuff areas unless they are escorted by a Team Member. There is one way in, and one way out (at the check in desk!) All other doors are alarmed or locked. Unauthorized persons will not be permitted to enter the gated areas, or the gym area.